Constant development is a core belief amongst the fellowship at Shree Swaminarayan Temple – Dharma Bhakti Manor. Based on a 17 acre site we are in a real good place to develop the area for the young and the elderly alike. The term of continuous development is nothing new to our Satsang as Shreeji Maharaj Himself consistently developed the congregation through a variety of activities such as Sadavrats and holding festivals on a large scale. The Nand Santos who were a real inspiration worked night and day to ensure that the true form of Bhagwan is realised by many across the different part of India. Maharaj, Himself supported this very cause through discourses in a form of questions and answers to ensure that even a layman can understand the meaning of the Vedas and other scriptures. This very principle of education and guiding people onto the pathway of spirituality exists today. The fellowship also believes in foundation of allowing females to perform their own Bhakti. From birthplace of the Temple in Edgware to the 17 acre site in Stanmore truly marked a significant change in the way we perform devotion to the Lord. This allowed the male and females to perform their own Bhakti and do their own Seva of the Lord which is as prescribed by Lord Swaminarayan. Understanding the need that time is of an essence for most and to encourage consuming of freshly made Indian sweets and savouries. Dharma Bhakti Manor provides a pure vegetarian sanctified foods service for devotees. 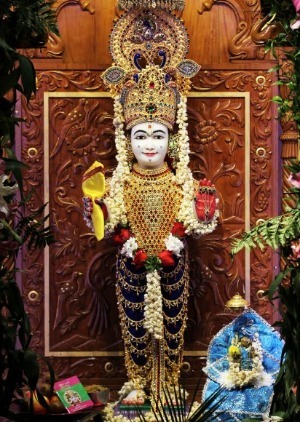 This follows on from the belief that Lord Swaminarayan instilled of making pure foods with mind focussed on the Lord. To evolve with the times and keep the grass root belief is at the core of what we do. This allows the younger generation to come forward and truly embrace Sanathan Dharma (Hinduism) for what it is.